I couldn't pass on it, although I didn't have any recipes in mind. 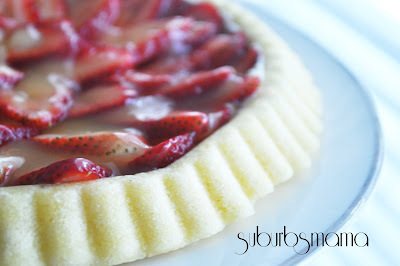 I knew I wanted a sponge cake with some strawberries, I scoured the internet and combined three different recipes to make this one tart. We had it for dessert last night and everyone loved it! 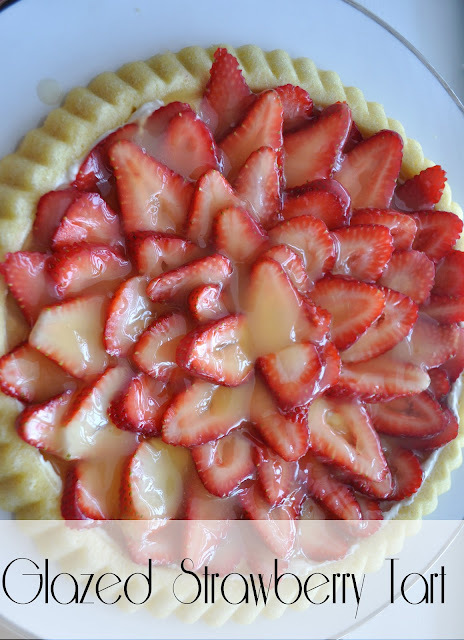 This is kind of time consuming to make, but the recipe makes 2 tarts. I baked my sponge cake a day before I served it, that way I just needed to make the filling, slice the strawberries and drizzle the glaze over the strawberries on the day I served it. 1. Take eggs out of refrigerator at least one hour before using. In a small bowl, sift flour, baking powder,salt, and 1 cup sugar. 2. In a large mixing bowl, combine egg whites and cream of tartar. Beat until soft mounds form then add ½ cup sugar, 1 tablespoon at a time, and beat until stiff peaks form. 3. Combine egg yolks, water, and vanilla. Stir into flour mixture. Beat a minute or two, until well blended. Fold egg yolk mixture into stiff egg whites until blended. 4. Spray two, 11-inch flan tart pans with non-stick cooking spray. Fill each pan about ⅔ full. Shake until batter is evenly spread. Bake at 375°F for 10-12 minutes, or until cake is golden brown. Do not open the oven door in the first 10 minutes! Invert pan onto a large platter and cool completely before filling. I let my cakes cool completely and covered them until the next day. The filling acts as a barrier between the strawberries and sponge cake so it doesn't get all soggy from the fruit juices. For the filling, cream together the cream cheese, sugar, and vanilla. Spread over the cooled crusts. For the glaze, mix together the sugar and cornstarch in a small saucepan. Whisk in the water, orange juice and lemon juice. Bring to a boil over medium heat. Boil gently for one minute. Remove from heat and cool completely ( I transfered the glaze into a bowl and stuck it in the fridge to help it cool faster). Spoon the glaze evenly over the strawberries. Refrigerate until ready to serve.